Cambodian cuisine is a strong indication of the ancient Khmer civilization and its long colonial history. The word Khmer is derived from the Pallava language of southern India that refers to predominant ethnic group, food, and language of Cambodia. Khmers are considered descendants of mixed ethnic group combining Indians and natives of South East Asians who first migrated and inhabited South East Asia region originally called Austroasiatic region since over 3,000 years ago. It wasn’t certain whether the migration from the north was due to invading Tibetans or due to agricultural purposes since fertile land along major rivers was suitable for growing crops. In its early days, the Khmer’s language, religion, and cultures were heavily influenced by Indian and Chinese traders as evidenced by the introduction of noodles and curry in Khmer cuisine. The use of coconut milk and turmeric to make curries and desserts shows traces of Indian influence. In fact, one of the popular Khmer dishes is Amok or steamed fish cake made from curry mixed with coconut milk and wrapped in banana leaves. Thais have the same dish but called it Hormok. Because of its location to many waterways, the staples of Cambodians remain fish and rice. Fish is the most common meat as they are abundant from the Mekong River, Bassac River and Tonlé Sap (the largest freshwater lake in South East Asia) and can even be freshly caught from rice paddies. Fish can be grilled and called Trey Aing, fried with vegetables called Trey Chean Neung Spe, added to sour soup called Samlor, fermented into paste called Prahok. Prahok is an integral ingredient of Khmer cuisine to add salty taste when friend with meat and chilli or eaten as dips with boiled vegetables. Prahok is a very authentic Khmer cuisine. In Thailand, the similar fermented paste is made from small shrimps called Kapi while the Philippines called it Bagoong (pronounced as Bah-Go-Ong). Going back a little bit to the history. 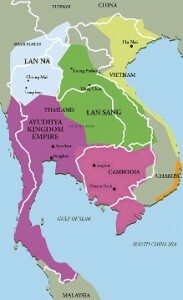 Khmer empire was much bigger before than today (refer to Map 1: Cambodia Today). During the 9th to 13th century, the empire extended to include parts of today’s Thailand, Laos, Vietnam, Burma, and Malaysia and made Angkor its capital (refer to Map 2: Khmer Empire). Following the decline of Khmer empire in the 13th- 14th century, Sukhothai Kingdom and Ayutthaya Kingdom of Siam (old name of Thailand) ascended and annexed part of Khmer including the capital city of Angkor (refer to Map 3: Ayutthaya Kingdom). The Khmer was forced to move to a new capital city, Phnom Penh in 1434 by King Ponhea Yat. Ever since then, this part of Khmer remained under Siamese territory for more than 400 years. This is why Khmer cuisine received much Thai influence and vice versa. It shares many common dishes with Thai food, but generally not as spicy and sweeter. For example, jasmine rice, glutinous rice, fermented fish paste eaten with boiled vegetables, and sour spicy soups using galangal, lemongrass and kaffir leaves. Due to Siamese and Vietnamese continuous invasion, Cambodia appealed to French for protection and became a French protectorate in 1864. For nearly a century, Cambodia was drawn into the French Indochina union which includes southern Vietnam, Laos, and Cambodia. Interestingly, in the olden times, the Khmer called Vietnam ‘Khmer Krom.’ Sharing the same colonial heritage being part of Indochina Union, it borrowed many dishes from Vietnam and adapted to suit their tastes. Moreover, as a French legacy, Cambodians were taught to eat baguettes (long French bread) with pâté (minced meat spread), sardines, or eggs as breakfast. It is usually accompanied with strong black coffee in sweet condensed milk. Post World War II, King Norodom Sihanouk proclaimed its independence in 1953 but later overthrew by General Lon Nol who changed Kingdom of Cambodia to a Republic. Political situation remained chaotic in Cambodia. Only 5 years after came the notorious genocidal period of Khmer Rouge led by Pol Pot. As mentioned by Sachin and Manish, this period destroyed the country and left people emotionally marred. Four years after the brutal period, in 1979, Vietnam ousted the Khmer Rouge and slowly rebuilding the country for more than 10 years. The situation was rescued when the United Nations intervened in 1992 and helped restored monarchy in 1993 until today. It is fascinating how Khmer’s long tumultuous history can be depicted through Khmer cuisines. How a variety of its menus created from unique blend of ingredients show traces of cultural influences from India, China, Thailand, Vietnam and France. And, this is what makes Khmer cuisine authentic and special. ← Whom are you sleeping with? Yum!! It will be interesting to see the cultural mix in the food. Would love to see some pictures of their famous dishes. What are their most traditional dishes? Sachin and I will be posting another blog with pictures of popular Khmer dishes soon! We will make you all hungry. I wonder where the history of black coffee with condensed milk come from? Was it a French-influence? I could not recall a French coffee concoctions which use condensed milk. It could have well been a Vietnamese influence as they do drink their coffee with a generous portion of super sweet condensed milk. Do they serve it using similar contraptions? A demi-tasse metal cup with built-in strainers? Delicious post! I loved Amok Trey (Fish Amok) when I visited Siem Real a couple of years ago. It tasts very much similar to Indian/Malay curry fish. I believe Amok is a cuisine style and therefore not only Amok Fish, but Amok Beef, Amok Chicken are also popular dishes in Siem Reap. There are many Khmer restaurants in the old market area, which I am sure we will be going. I also highly recommend the Khmer food at Angkor Palace Resort & Spa, which I personally felt are better than many independent restaurants. I did a bit of research! (http://en.wikipedia.org/wiki/Vietnamese_iced_coffee) Coffee was introduced by French colonists, but due to the lack of fresh milk, condensed milk was used instead. This traditional form of drinking coffee has been adapted in many Asian countries including Singapore, Hong Kong and Thailand as well. When we arrived today, the tour guide was telling us that Cambodian food was not so spicy. We just had a very nice dinner of Khmer food and it had a very nice and interesting spice. Let’s see what the rest of you think today. Love it! I can belive when I see it! Really enjoyed reading your post, top notch work. I want to sell my timeshare. Timeshare resale organizations, does anyone know a well reviewed well known place to work with ? Siem Riep is a great place. I enjoyed my time there with my team of SEO experts from top Singapore SEO company. Useful information about Khmer history of foods. However, I think Khmer food mostly used the Kroeung as one of the main ingredients. Such as Chha Kroeung (fried dishes), Samlor Machu Kroeung (sour soup). Great information you have shared here. Just sent this article to my co-worker who is covering this topic. Thanks. rentals, entertainer bus rentals, sleeper coach rentals and more. Very interesting articles. Can I make the copy of this information and post to my website – http://www.asianventure.com/cambodia.html to provide traveler some culture background of Cambodia. It’s nice to know the information. Thank you for sharing! Whom are you sleeping with?